Page 2 - ISL 2018-19: How Have Bengaluru FC's Key Players Fared So Far? Last season's ISL Player of the Year, Sunil Chhetri, was well dealt with by Chennaiyin's defence in their first fixture. The Blues skipper was largely isolated out on the left flank with veteran defender Inigo Calderon having the measure of him. Whenever Chhetri received the ball, he was simply closed down and he struggled to impose himself on the game. It was one of the reasons why Bengaluru attacked a lot more through the right flank with Udanta Singh and Miku giving left-back Jerry Lalrinzuala a tough time. 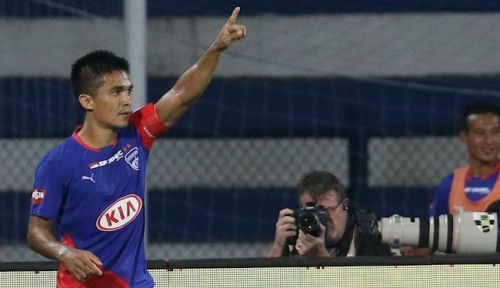 However, Chhetri was far more involved in the second game against Jamshedpur FC as this game saw the Blues probe and attack through both flanks. The 34-year-old forward also drifted in towards the centre to get more involved. His ability to hold on to the ball under pressure and vision to get the ball forward certainly helped the Blues in the early stages and his goal almost sealed a win in the 88th minute. Harmanjot Singh Khabra spotted his skipper's run from deep and sent in a cross that saw Chhetri glance his header goalward and score. He almost made it 3-1 too after latching on to Miku's through ball but saw his effort come off the post. ISL 2018-19: How has each club fared so far?